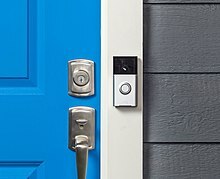 Ring Inc. (formerly Doorbot) is a home security company owned by Amazon. Ring's head office is in Santa Monica, California with a secondary office in Kyiv, Ukraine. In 2013, Siminoff appeared on Shark Tank, asking for $700,000 for his company, at the time called DoorBot, which he estimated was worth $7 million. Kevin O’Leary made an offer as a potential investor that Siminoff declined. After being on Shark Tank, Siminoff rebranded the company and it received $5 million in additional sales. In 2016, Ring inked a deal with Shaquille O'Neal, trading an equity stake in the company in exchange of TV and online commercials by the basketball celebrity. Since then, the company raised more than $200 million in investments and counts Kleiner Perkins Caufield Byers, Qualcomm Ventures, Goldman Sachs, DFJ Growth and Sir Richard Branson—founder of Virgin Group—as prominent investors. Ring was heavily invested in by Amazon in February 2018 for an estimated value of between $1.2 billion and $1.8 billion. The company's first product, released in 2013, was a doorbell with Internet connectivity, a high-definition camera, and a motion detector. The Ring Video Doorbell is a smart doorbell device that allows users to monitor and operate their front, back and garage doors remotely. When the doorbell is pressed, the Ring application begins a VOIP video call to a connected device, so that the owner can see and speak to visitors. The product was developed by the software company Blue Trail Software. In 2017, Ring released its second version of the device, Ring Doorbell 2, with a rechargeable battery pack, night vision, a motion detector, speaker, and microphone. Ring Neighborhoods is an additional security feature that helps non-video doorbell users monitor suspicious activity on their app. In 2015, Ring released the Stick-Up Cam which incorporated the same features as the doorbell but without the actual doorbell button. In 2016, the Ring Floodlight Cam was introduced with two 1100 lumen LED floodlights. In 2016, Ring partnered with Los Angeles Police Department and installed Ring Video Doorbells on 10 percent of homes in Wilshire Park, California. The LAPD’s data showed that there was a 55 percent decrease in break-ins within the first six months of the doorbells being installed. In addition to break-in prevention, Ring products have been cited as aiding the police in identifying perpetrators. In July 2018, Ring launched an alarm security kit, which includes a keypad, siren, and motion sensors. At CES 2019, Ring announced a peephole camera. ^ a b c "Company Overview of Ring Inc". Bloomberg L.P. Retrieved 2019-04-09. ^ Perez, Chris. "Doorbot Is Knocking Upon the Future of Doorbells". Apartment Therapy. Retrieved 2019-04-09. ^ Hsu, Jeremy (2013-01-25). "'DoorBot' for Homeowners Hits $250,000 Goal". Tech News Daily. Archived from the original on 2013-01-26. Retrieved 2019-04-09. ^ "After This Entrepreneur Got Nothing on 'Shark Tank,' Richard Branson Wrote Him a Check". Inc.com. 2015-08-19. Retrieved 2017-12-13. ^ a b "This guy turned his failure on 'Shark Tank' into a $109 million investment from Goldman Sachs". Business Insider. Retrieved 2017-12-13. ^ Susan Adams (27 February 2018). "The Exclusive Inside Story Of Ring: From 'Shark Tank' Reject To Amazon's Latest Acquisition". Forbes.com. Retrieved 25 March 2019. ^ Friedman, Zack. "Shark Tank Reject Raises $209 Million, Fights Crime". Forbes. Retrieved 2017-12-13. ^ "UPDATED: ABC's 'Shark Tank' makes its decision on Allen County native, veteran Bart Lomont's Robin Autopilot | News, Sports, Jobs - News-Sentinel". www.news-sentinel.com. Retrieved 2017-12-13. ^ DFJ (2017-10-19). "Jamie Siminoff, Ring". DFJVC. Retrieved 2017-12-13. ^ Kim, Eugene (2018-02-27). "Amazon buys Ring, the smart doorbell maker it backed through Alexa Fund". CNBC. Retrieved 2018-02-27. ^ "Amazon is making its second-biggest acquisition ever — the doorbell company Ring". Recode. Retrieved 2018-02-27. ^ a b Dave, Paresh. "Ring modernized the doorbell, then its inventor, Jamie Siminoff, went to war against crime". Los Angeles Times. Retrieved 2017-12-13. ^ "The real cost of setting up a smart home". USA TODAY. Retrieved 2017-12-13. ^ a b Conner, Katie (2017-11-14). "Technology helping to deter holiday package thieves". KNXV. Retrieved 2017-12-13. ^ Pollicino, Joe (December 6, 2012). "DoorBot lets you see and talk with who's at the door from the comfort of your smartphone (video)". ^ Ashe, Dru (December 7, 2012). "DoorBot: The Wi-Fi Doorbell That Connects to Your Smartphone | Complex". ^ "3 Innovative US Companies Flying To Latin America For Technology". Latam-outsource.com. 3 December 2018. Retrieved 23 March 2019. ^ Officer, Gary Kaye, Chief Content (2017-11-08). "2017 Holiday Gift Guide Part I - Gifts for 50+ 1 of 2". Tech50+. Retrieved 2017-12-13. ^ "TVEyes Media Monitoring Suite - [Transcript]". mms.tveyes.com. Retrieved 2017-12-13. ^ "Okotoks home owner's doorbell video leads to capture of alleged invader | Metro Calgary". metronews.ca. Retrieved 2017-12-13. ^ "Local package thief caught from a doorbell". KSNT News. 2017-11-12. Retrieved 2017-12-13. ^ Wollerton, Megan (20 July 2018). "Ring Alarm Security Kit review". CNET. CBS Interactive. Retrieved 3 August 2018. ^ Sawers, Paul (2 October 2017). "Ring launches Protect, a DIY home security system starting at $199". VentureBeat. Retrieved 3 October 2017. ^ Wetzel, Kim (2 October 2017). "Affordable, DIY Ring Protect Looks to Lock Up the Home Security System Market". Digital Trends. Retrieved 3 October 2017. ^ Graham, Jefferson (7 January 2019). "No doorbell, no problem: Ring introduces Door View Cam that replaces peephole in homes". USA Today. Retrieved 12 January 2019. This page was last edited on 12 April 2019, at 09:59 (UTC).